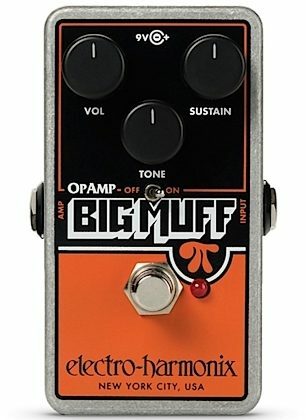 With original late-70s Op-Amp Big Muffs selling for exorbitant prices, Mike Matthews decided to take the power to the people and reissue the classic pedal at a price that players could afford! The circuitry of the new Electro-Harmonix Op Amp Big Muff Overdrive Pedal, sometimes also referred to as the IC or V4 Big Muff, has been faithfully re-created while several practical enhancements have been added including a compact, die-cast chassis and true bypass switching. The pedal relies on op-amps rather than transistors and three gain stages rather than four, to create its signature sound. It's a sound that's been described by noted Big Muff collector and historian, Kit Rae, as: "a huge, crushing Big Muff sound with more crunch" great for grungy, wall-of-sound distortion, heavy rhythm playing and heavy leads. Overall: I own an original 78 op amp, so I jumped at the chance to add this to the board, as I don't like lugging around my vintage muffs. It doesn't nail my 78 dead on, but whose to say my original sounds like it should? All in all, it comes close enough to the Siamese fuzz we know and love, takes up 1/3 the real estate of the original, features true bypass (the original does not), and costs half of what a boutique pedal does these days. Easy to use and dial in those thick tones. It seems to lack the low grit growl when you dial back the sustain, but I have another fuzz for that.